Whether the economy is up, down, rising or falling influences your success—to a degree. What matters even more is something within your direct control: your economy, the economy of one. In this stirring presentation, internationally renowned speaker Mark Sanborn shares mindsets and methods that will keep you winning, growing and succeeding, no matter what’s going on in your world. You’ll learn practical ideas to overcome obstacles, create value, innovate continuously, connect with key contacts, practice gratitude and much more. And it’s not just a “feel good” seminar. 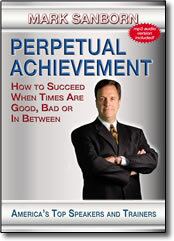 These strategies will inspire, inform, and help you generate the results you need to create perpetual achievement in every area of your life.